Removable Dentures and Partial Dentures are options to replacing missing teeth. They are made of acrylic and customized to your mouth for comfort and esthetics. Some can be fabricated to fit over dental implants, which allows for a much more secure and strong fit to your denture. Complete dentures can either be “immediate” or”conventional.” Conventional types are made when the gum tissue has healed after teeth have been removed. This usually occurs 8 to 12 weeks after the teeth have been extracted. Immediate dentures are created ahead of the procedure and are often placed just after the teeth have been removed. Because of this, the wearer does not need to be missing teeth while healing. It should be remembered that your gums and bones lose size and strength over time; this is especially true of the period after a tooth extraction when the mouth is healing. Thus, during the healing process immediate dentures will require more fine-tuning for a proper fit, and are recommended to be a temporary remedy until the conventional dentures can be made. A partial denture often consists of a number of prosthetic teeth affixed to an acrylic, gum-colored base. This is sometimes connected by a framework of metal that keeps the partial denture in place. A partial denture helps a smile by filling in the space left by missing teeth, while keeping neighboring teeth from shifting their position. 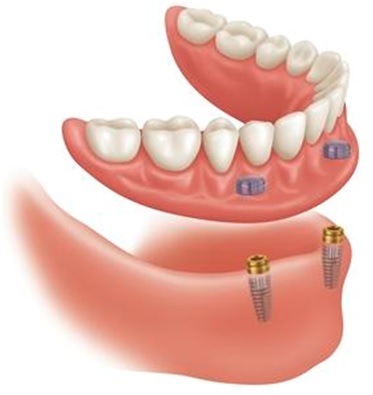 Dental implants can be incorporated into the fabrication of dentures and partial dentures to gain stability, retention, and a better fit, resulting in a more confident smile.